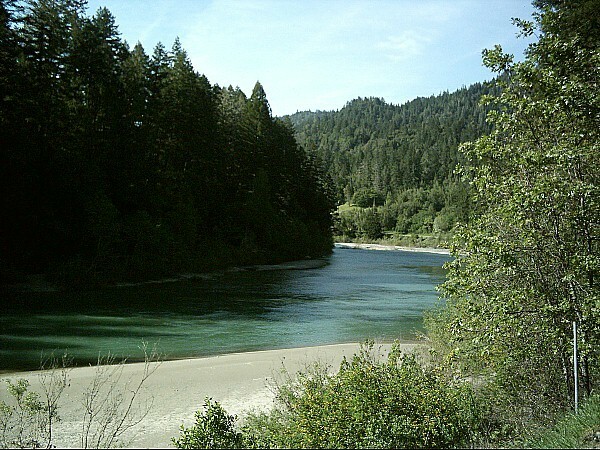 I can describe Northern California in just one word – Spectacular. But again, I am getting ahead of myself. Maybe because I knew I would have the shortest drive day thus far ahead of me, or maybe feeling accomplished (having conquered a part of Highway 1 the day before that made the stretch between Carmel and Montereey look like driver’s ed), or maybe just being awoken by a gentle surf, I rose with such a feeling of tranquility. 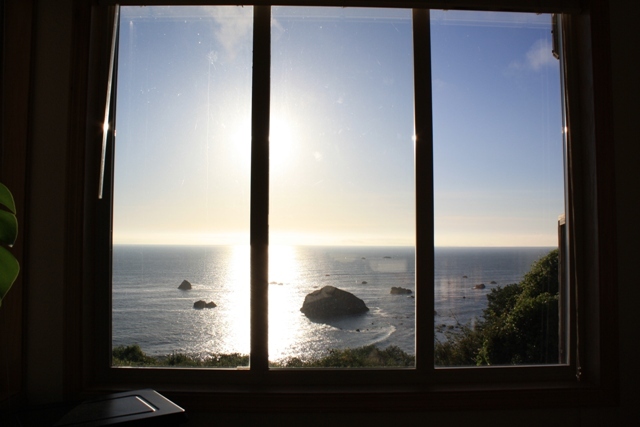 I would say that on a map Gualala is unremarkable, but my soul had been fed by the Gualala River/Pacific Ocean estuary outside of my window, the redwoods at my back, and the incredible South African transplant I had met the afternoon before. Gualala is quite remarkable in that regard. I also got to meet and speak with another transplanted (from my area – LA) very young couple who managed the motel where I stayed. They had moved here to make a go of the solitude of this place and hopefully start a family. I encouraged them to tell me how they felt about their relatively new digs over the complimentary continental breakfast served in the motel office. This is another perk of traveling alone. There is nobody demanding your attention, so you have the luxury of directing it toward absorbing what the moment is offering. Remember, my husband is the energizer bunny with the AAA personality type. He is always pushing me to hurry, hurry, hurry which leaves no time for anything but the task at hand. 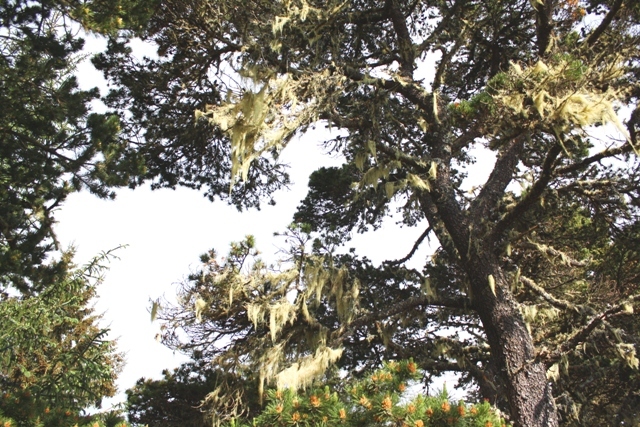 The couple told me they loved Gualala, but the transition had been difficult. The nearest Walmart was 3 hours away (driving time one way) and while they had chosen this place because of it’s remote location, they found themselves longing for the option of stimulation (restaurants, theater, museums, sporting events, amusement parks, etc.) and conveniences (groceries, shopping malls, medical/dental care, etc.) that we who dwell in the city take for granted. Still, they were not going back. The traffic, fight for parking, crime, cost of living, and the lines you must stand in for ANYTHING kept them on track to continue to adjust. What fantastic role models for braving new frontiers they were. Yet another notch in my fascinating people belt. With both my soul and stomach satiated, I packed the pony, put the top down, and hit the road again. I was blazing an unfamiliar trail from here on out. There is nothing quite like the excitement and anticipation of penetrating the perimeters of the familiar, liberating yourself from the chains of your own making that bind you to your quotidian. I was ever so slightly becoming aware of something else. Just a dawn of awareness if you will. The only way I can describe it is something twisted, turned, and pulled too tight. Like a rubber band when you twist it around and around while pulling it between your fingers to the point right before it breaks. The pinch points seem to be at each end, but in reality is every twist in-between. I am not big on self-awareness, not because I have anything against it, I just never had time for such a self-indulgence. When self-awareness has crept in on its own in the past, it was usually as a result of a tragedy or horror. Not anything I wanted to spend any time analyzing that’s for sure. What I was feeling was entirely new. A gentle awakening. A look inside that however fleeting, was generated by a calm desire to understand the obstacles lying between where I was, and where I wanted to be. I also become aware that this journey was both physical and metaphysical. This is not something I had planned. Was it as a result of me taking this journey alone? Was it as a result of the time and distance I had put between the year’s events? All I wanted to accomplish with this trip was to answer the question…WOULD I BE ALRIGHT ALONE. I still didn’t have an answer, nor did I have an answer for all of the rest of what was happening. It seemed like I was becoming more of a mess than I was straightening myself out. The drive between Gualala to the point where I would turn back inland to join the 101 again was nothing less than stunning, and what I had envisioned when planning this journey. The sea became much more untamed than So Cali’s beaches, and I drove so close alongside it that I could feel the spray, taste the salt, and smell its incomparable fragrance. Who needs Calgon? Take me away Pacific. For the first time I was eager to go inland. 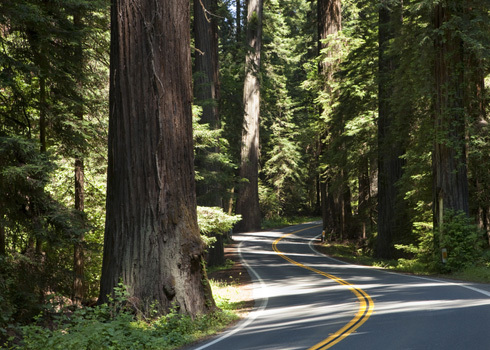 I was looking forward to driving through forests of my favorite tree – the California Redwood. Let me say I am not what you would consider a tree hugger, but when it comes to this tree I would do whatever it took to preserve it. The tallest and longest living tree in the world grows only in this place. My love affair with these ancient living monoliths began when I first laid eyes on them as a little girl. My mother introduced me to them and her love for them was infectious. She in fact wants her ashes spread among them which is going to be a trick, since I’m sure that’s probably illegal. Since our first meeting, I have spent time with them but in inland places like Sequoia and King’s Canyon Nat’l Parks. Never enough time. The old growth forests, like its mammalian equivalents the land elephant and ocean whales, were logged nearly into extinction. The giants were so threatened by tourists and loggers alike that the “Save the Redwoods League” was formed at the turn of the century and the preservation fight that continues today was born. Since it takes a redwood tree 100 to 200 years to mature, every Californian (and for that matter everyone everywhere) should be concerned for their future safety. 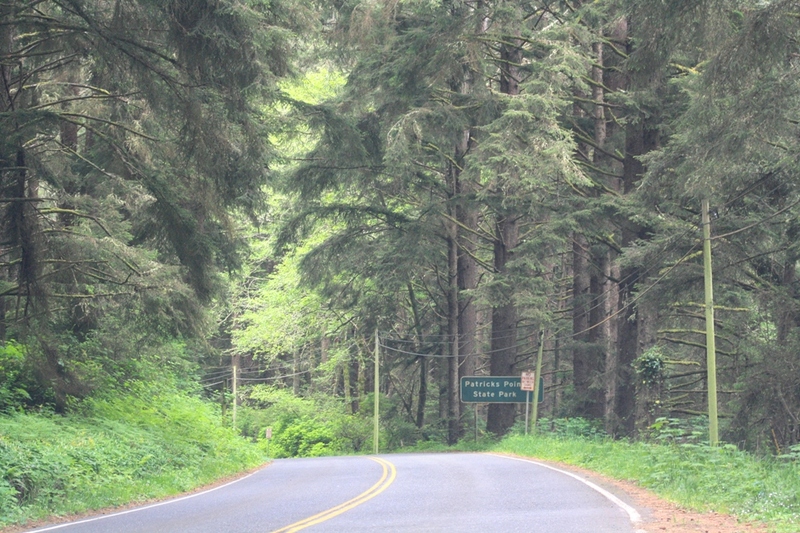 Reacquainting myself with them by foot by way of the Newton B. Drury bypass was planned for tomorrow, for today I planned to enjoy them from my convertible by way of highway 271 (old highway 101) that parallels the new highway, but would allow me to drive through the forest on just two lanes. It didn’t disappoint. I followed the Eel River through these magnificent trees for 31 miles. The sun dappled road and the perfume from these one-of-a-kind trees is like no other. It was so much warmer here that I was actually shedding layers as I drove. The sweet explosion to my senses was intoxicating. A one-dimensional photo leaves so much to be desired in capturing the experience. I joined the 101 again to its 8 lane meander through this magnificent stretch of land as it bypasses the Lost Coast, and coincidentally the object of my Next Big Thing. As I finally got closer to the coast again, the weather changed dramatically from sunny and warm to grey, wet, and cold. I approached Eureka with much anticipation, since I knew this place was lousy with old Victorian homes and a colorful history that only a town built by salty seamen and brawny loggers could render. 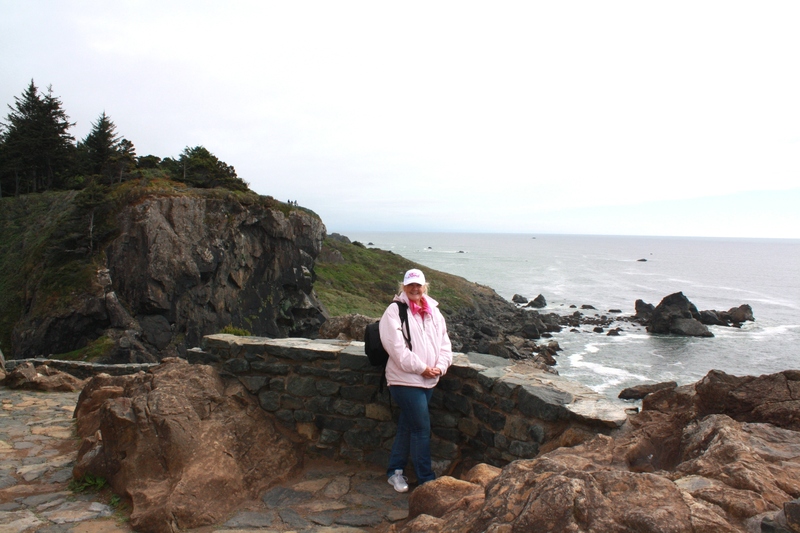 I kept putting back on layers with my pink t-shirt, pink sweatshirt, pink ball cap, and finally my new pink Monterey wind breaker with the hood pulled tightly over my ball cap as it started to sprinkle. Hello Kitty does Pacific Coast Highway. As I entered into Eureka I was met with a much different sight than I expected, which attributed to it being dramatically worse in my memory than it actually was. Good people of Eureka, forgive me in advance of what I am about to say. There was people wandering everywhere on the street in the middle of the weekday, and they seemed to be walking in a daze like zombies. I would later confirm this with a Eureka resident I met in Redding, Eureka has a serious drug problem. There was quite a bit of police activity, and I became painfully aware that my purse and canon camera were laying on the passenger seat in my convertible for anyone to grab. I felt scared and vulnerable. I didn’t even feel safe enough to pull over and put the convertible top up. The outskirts of town (despite being on the coast), were industrial and for lack of a better word…ugly. Why had San Francisco done such a good job with its shipping docks, and Eureka so poorly? In a word…money. Eureka’s long financial descent started with the gold and lumber booms ending over the last century, then the economic hardships of the 70’s, 80’s, and most recently in 2009 had hit this city harder than it could recover from. I would have thought coming from such a metropolis as the LA area would have better equipped me for this, but I was at a loss to ingest the desperation on Eureka’s streets. In LA prosperity and everything in between co-exist with poverty, but not in this place. There was no tolerance in any of it. I was so glad I had not planned to bed down here. I couldn’t leave fast enough, and again I apologize to the Eurekans. I know I didn’t give you anything even resembling a chance. 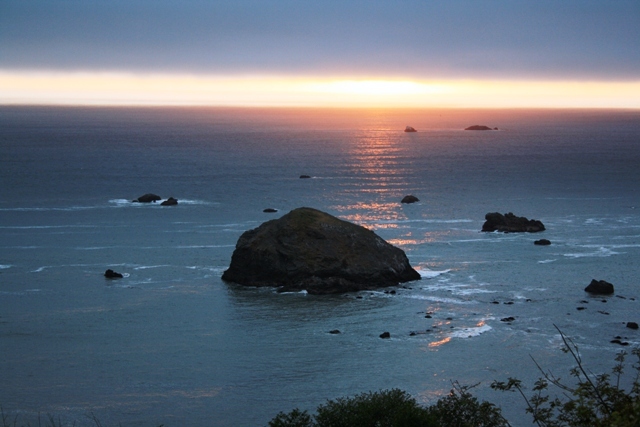 On to my destination of Trinidad, CA. I was terrified at this point that Trinidad was going to be more of the same I had seen in Eureka. I felt very alone and…well, Hello Kittyish. 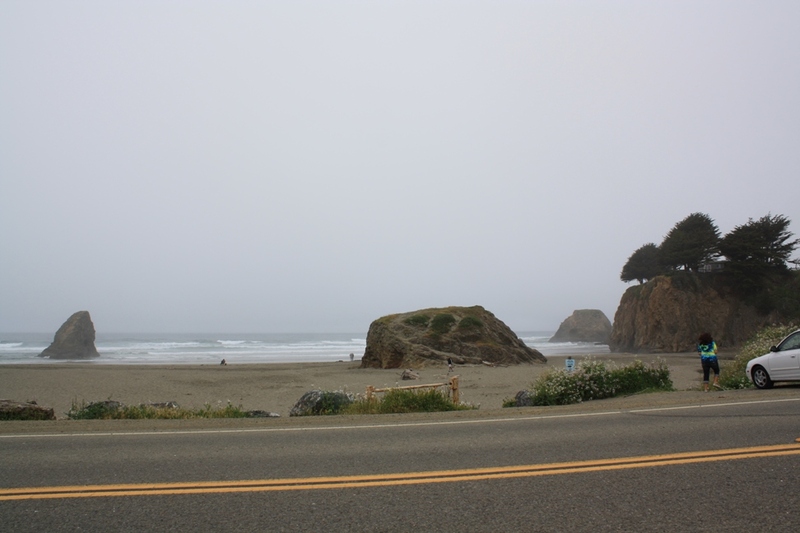 I pulled off of the busy Highway 101 to Trinidad with much trepidation, all the while my mind was scurrying for a plan B.
I was “wowed” as soon as I left the interstate. 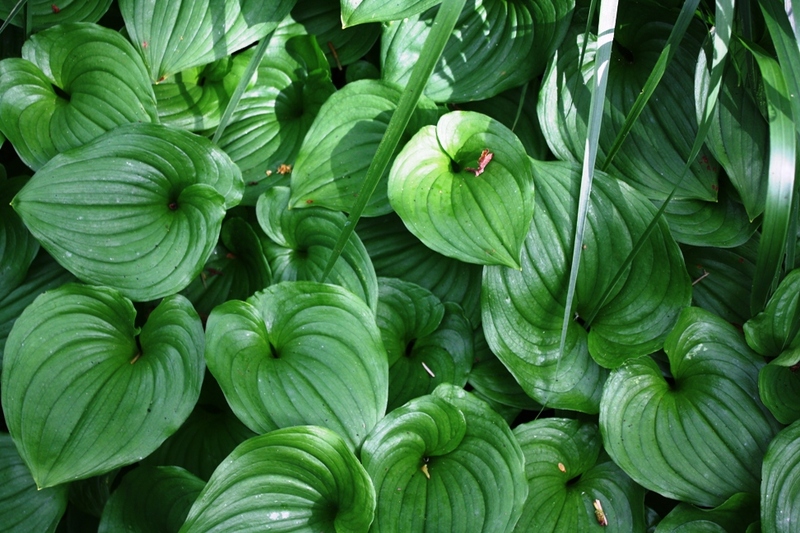 The sun came out to meet me like a cheerful greeter through the dazzling mossy canopy. I had a heck of a hard time finding where I planned to bed down for the night as it was a Bed and Breakfast and not your standard hotel. While it was beautiful terrain, I was still skeptical about its hospitality. I finally found my destination and discovered a note on the door “Back in 3 hours”. I knew I was a bit early for check-in, but seriously? Now what was I going to do if I didn’t feel safe here? My window on options was closing fast. I drove down the street a piece to Patrick’s Point State Park. This photo is not very good (taken from over my windshield again) so you can imagine how green it really was in 3 glorious D.
Green is not a color I am accustomed to in So. Cali. After paying the park fee, I struck out with my trusty map of the small park to find, you guessed it, the sea. I parked and reluctantly left all of my worldly belongings in my trusty steed, and headed out on foot to one of many trails in the park. And there it was. 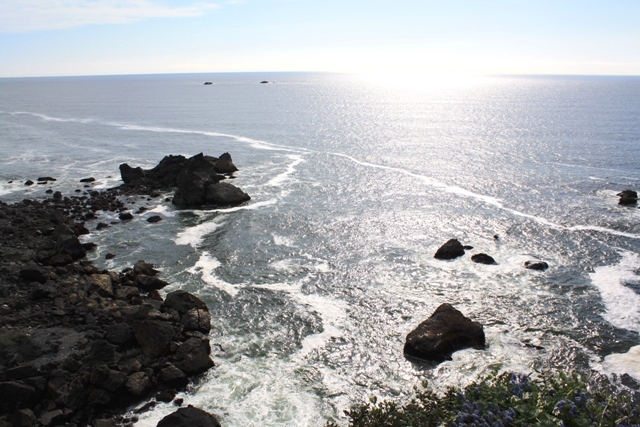 The mighty Pacific in all her glory. There was a couple on Outlook Rock (where I took this) that were taking turns snapping photos of each other. I offered to take a photo of them together, and I knew he was from LA by the reluctance with which he handed me his camera. I took the photo and confirmed my suspicions…he was from LA. In fact, he was an oncologist and also on the board of directors for the UCLA cancer research center, where my niece (Susan’s daughter) was working to get her Masters Degree in cellular and molecular biology. When I asked if he knew her, he said he did. Small world eh? He returned the favor by taking a photo of me with my camera, in all of my Hello Kitty Layers and Steroid Swelled glory. I asked him where he was staying, as this was still a worry for me. He gave me the name of the exact Bed and Breakfast I had booked to stay the night and had found the “be back later” note on. It couldn’t be bad if this doctor was staying there. I asked him how he liked it, he stated that they liked it so much they cancelled their plans to spend time in Napa Valley so they could extend their stay. Once again he put someone in my path that renewed my energy, filled me with happiness, and was such a genuine and unique people (both him and his wife) that my life is richer for knowing them. We parted ways after chatting and I went on to explore the park with a much lighter heart. The sun was beginning its descent and I wanted to take in a little more. The photographic possibilities were endless. 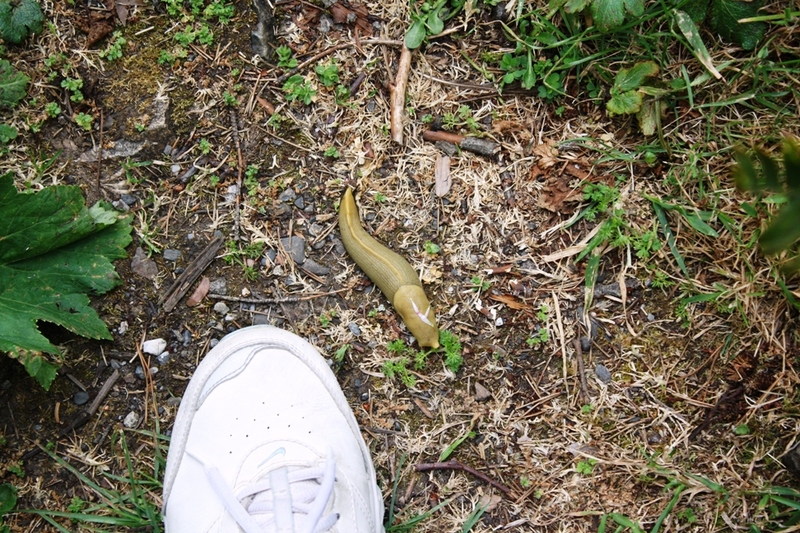 The biggest slugs I have ever seen in my life were plentiful (I was careful not to step on one and make a mess of my shoes and their life). Ew. I headed back to the B&B and found the door open and my host inside. I had spoken to the owner on the phone when I made the reservation, and at that time she had prompted me to ask if any of the large rooms on the second floor were available for an upgrade. I imagined staying in a coat closet with a toilet. When I took my key and made my way to my room you can imagine how wrong I was when I opened the door and caught sight of my view. This was the small room? Really? I couldn’t even fit in this photo the office, changing/make-up room (yes a seperate room for that) and ridiculously spacious bathroom, but who cares with this view? And my own stove/heater thingy in my own sitting enclave. I was already sorry I was only staying one night. 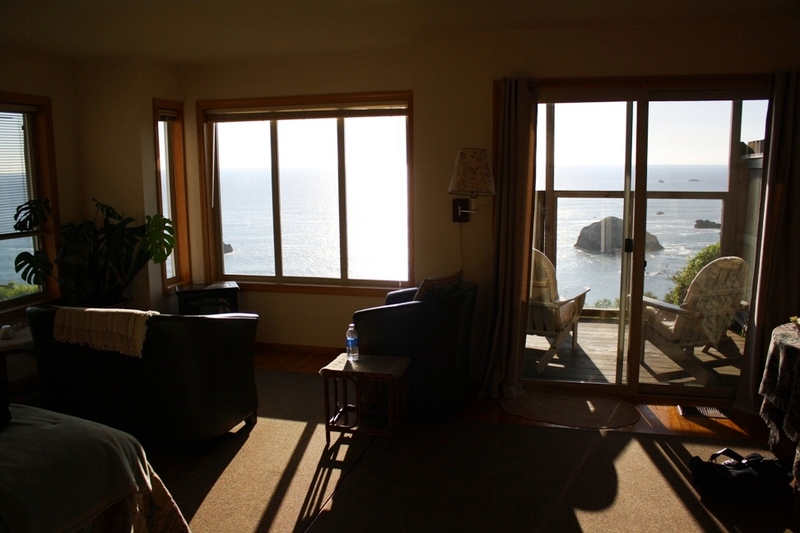 I walked out onto the deck and gazed at Turtle Rock outside of my room. Turtle Rock was very loud with barking. What the heck? 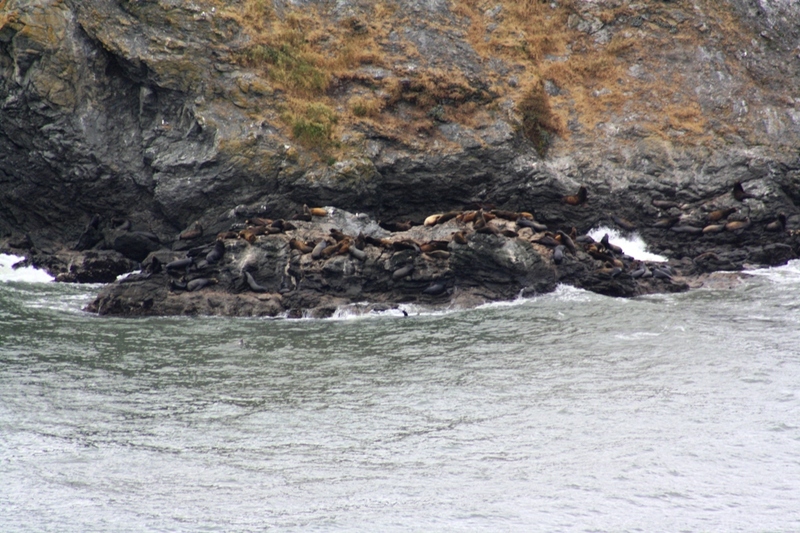 I retrieved my hubby’s trusty binoculars (as it turns out the hotel provides them too), and I found the source of the noise…California Sea Lions. They were at the base of the gigantic rock and in the rough water surrounding it. I found out from the owners that the noise was primarily coming from the male bull of this harem and all of the young males who were attempting to gain access to the rock to rest, challenge, and mate. 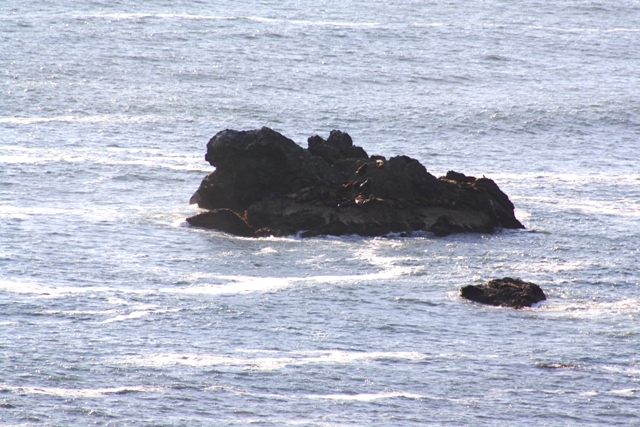 The other smaller rocks around Turtle Rock had groups of the pinnipeds as well. I could just make out their shiny coats in the setting sun. I actually went out for a quick meal (opting out of my customary PB&J with trail mix combo) and came back to sit and sip a cup of herbal tea by the fake fire and the most glorious of views. As I sat and watched the sun shine its last rays of the day, I quite unexpectedly felt one of the tight twists in my too tight rubber band give way. The Mixed Connective Tissue Disorder with Autonomic Involvement (ever after thought of as the Lupus Link in my mind) I had been in the fight for my life against for a year suddenly didn’t seem like such a heavy burden. I was finally at peace with it. Suddenly, and with no conscience effort. I was again mindful of the enigmatic awareness of what, I wasn’t sure. That peaceful self-awareness that had started my day had also ended it with an incredible gift. The internal war I had waged against the dark passenger that had ravaged my body was over. I was at peace with the Lupus Link, and if it chose to take my life, then so be it. It has been in God’s hands ever since. Sometimes the biggest battles are not won with will, but with grace. Until next time dear diary, I leave you with my Trinidad sunset.